1. I wish to introduce myself. 2. Hi. My name is Todd. 3. I grew up in the erstwhile wilds of a town named ROCK HILL, in SC, far away from where I now reside. 4. Where I now reside, the biggest thing young, 20something left-wingers have to protest is a television show in which a camera follows around a number of rather swarthy-looking folks as they attempt to live lives that (though they may protest vehemently against this point) are not really their own�and for money. 5. These protests are organized by resident artists for dubious, if not ludicrous, reasons. 6. As stated, I do not live very far from where many of these resident artists reside. Likewise, you can place bets to the affirmative that, whichever last-night we wish to be talking about, I was drunk. 7. I am not really A Drunk so much as I am just Drunk. 8. I say this very often and to very many people. 9. This column shall be about this sad fact and likewise about many other things. Though to ease your circumspection (or your perturbation at this point in the list) I would also like to say that there will be two, if not three, others whose writing will be appearing in various forms within this column (again I cannot stress enough how the topics discussed and/or written about, by myself or by these others, need not involve Retail or any sort of Mayor, yet they may). 10. The first of these others is Ms. Penelope Memoli. Penelope? 13. The second definite of these others is Mr. Joe Jarvis. I would like Joe to address the audience? 16. I would like to announce that we are neither as automated nor as astounded by ourselves as we may seem to be, at present. 17. Our desires are like yours. 18. And we actually desire these desires, again like you. 19. Further, none of us (as far as I know) has ever cuddled with any kind of live specimen of water-fowl for any extended period of time. 20. Likewise, none of us has ever declared that fact. So this is yet another first, here. 21. We have called ourselves, variously: WRITER, COMMERCIAL SCREENER, EDITOR, COOK, WAITER, INTERN, STUDENT, SOUTHERNER, ADDICT, APPALACHIANOID, AMERICAN, EURO-TRASH-HEAP, YANKEE, CUSTOMER SERVICE REPRESENTATIVE, PHONE DRONE, TEMP WORKER, PROOFREADER, HEDONIST, POSTMODERNIST, JANITOR, CLASSICIST, BARTENDER, COMPUTER ROOM MONITOR, PHILOSOPHER, and last, but certainly not least, the newly celebrated designation of STUPIDIST, the meaning of which I will spare you the necessity of sharing with us, at present�. 21. 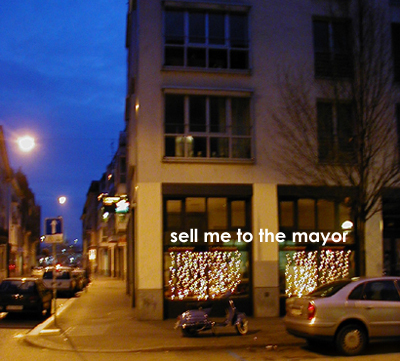 None of us has ever been sold to Mayor R.M. Daley, of CHICAGO, in IL, nor would we particularly wish to be sold to Mayor R.M. Daley, of CHICAGO, in IL. **clarified by Penelope Memoli and Joe Jarvis.